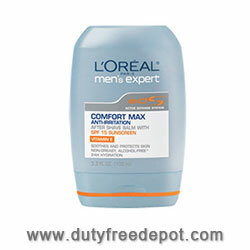 L'Oreal Men Expert Comfort Max Anti-Irritation After Shave Balm soothes, protects and hydrates your skin after shaving without alcohol or irritation. After every shave, squeeze a dime size dollop of product into your palms. Apply L'Oreal Men Expert Comfort Max Anti-Irritation After Shave Balm to the entire face before exposure to sun for 24 hour hydration in a single application.